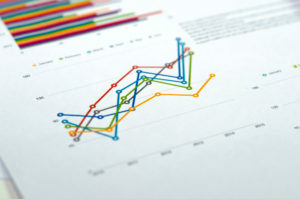 Following the recent release of public reports on law firm financial performance, it is easy to become preoccupied with year-over-year changes to key metrics. However, an even more interesting perspective emerges when we step back and analyze the changes in the legal industry over multiple decades. We have analyzed key statistics from the American Lawyer’s annual list of the 100 highest grossing law firms in 1987, 1997, 2007 and 2017. The growth of this segment of the legal industry over this period is remarkable – firm size, revenue and profits in this segment have reached a level which would have seemed impossible 30 years ago. While growth in select metrics has certainly slowed in recent years, overall the industry remains, perhaps surprisingly, robust. The total revenue generated by AmLaw 100 firms has grown from $8.6 billion in 1987 to $91.4 billion in 2017, nearly an 11-fold increase. This compares to a fourfold increase in U.S. GDP and 4.7 times growth in global GDP over the same period. 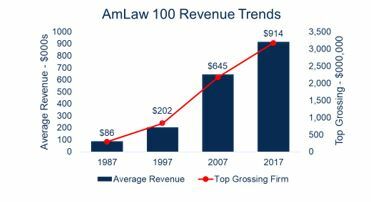 The middle decade showed the most explosive revenue growth, with AmLaw 100 firms more than tripling from $20.2 billion to $64.5 billion in revenue from 1997 to 2007. Not surprisingly, revenue growth in the AmLaw 100 slowed in the last decade compared to the previous two, but still showed a 42% increase between 2007 and 2017. In 1987 the top grossing firm was Skadden Arps, with $290 million in revenue. Today that level of revenue doesn’t even qualify for the AmLaw 100, with 31 firms exceeding $1 billion in revenue in 2017 – two of which surpassed $3 billion. Revenue per lawyer trends have been a bit less dramatic, with growth from $302,000 in 1987 to $987,000 in 2017. The last decade showed the slowest growth, with only a 16% increase in revenue per lawyer. By contrast the previous two decades experienced growth of 76% and 59%. The slowdown in revenue per lawyer is perhaps the most challenging dynamic for firms to manage and is the principal indicator of the flatter demand for legal services. While the growth in overall revenue might indicate an uptick in demand for services from the largest law firms, the flattening in revenue per lawyer indicates that there is productivity and rate pressure impacting many firms in the AmLaw 100. The growth in lawyers at AmLaw100 firms has also increased significantly over the last three decades. In 2017 there were nearly 98,000 lawyers in those firms, compared to 29,000 in 1987. To put that in simpler terms, the average AmLaw 100 firm today has 980 lawyers, compared to 290 in 1987. Only one firm on the list today (Wachtell) is below the 1987 average. The largest firm on the list in each decade has grown from 920 lawyers to 4,700 lawyers over the last 30 years, and 26 firms have more than 1,000 lawyers today. Like revenue growth, lawyer growth slowed somewhat in the last decade, with a 25% increase in total lawyers compared to 83% in the preceding decade. The growth in AmLaw 100 firms has been fueled in part by mergers and lateral movement. In the last decade we saw 514 mergers of law firms. While not all of these involved AmLaw 100 firms, many of the largest firms in the AmLaw 100 were propelled to the top by a major combination. Lateral activity, which was fairly uncommon in the 1980s, has accelerated over the last 30 years with many large firms growing via lateral additions. Growth of large firms has also shifted to include far more international lawyers, as existing firms have expanded internationally and new US-based global firms have been created. Seventy-eight of the mergers over the last decade were cross border mergers (where one of the firms was a US-based firm). Between 1992 and 2017 the number of lawyers outside the US on the National Law Journal’s list of the largest US law firms has grown from 2,500 lawyers to more than 25,000 lawyers. The number of international offices of these firms grew from 273 to 849 during that same period. We have also seen a change in the shape of firms with the emergence of the income partner role and the addition of staff attorneys and other timekeepers to supplement career track associates. The number of equity partners in AmLaw 100 firms has grown at a very modest pace over 30 years, from an average of 101 equity partners to 207. At the same time the non-equity partner group has skyrocketed. The number wasn’t tracked in 1987 but by 1997 there were an average of 26 non-equity partners and 20 years later that average reached 157. Today 43% of partners in AmLaw 100 firms are non-equity partners. 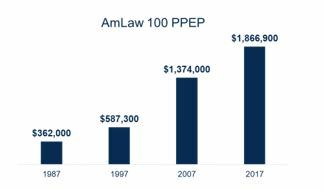 Despite the flattening of growth in revenue per lawyer, profits per equity partner (PPEP) in the AmLaw 100 have remained strong. In 1987 PPEP averaged $362,000, but grew to $1.87 million in 2017, more than a fivefold increase. When adjusting for inflation the 1987 PPEP would be $773,000 in 2017 dollars, so non-inflation growth exceeded $1 million per partner over 30 years. In 1987, only three firms had PPEP over $1 million, but by last year 74 of the 100 firms exceeded $1 million PPEP. Profit growth has been driven by the growth in revenue per lawyer, increased expense control, particularly in recent years, resulting in more money dropping to the bottom line, and the increased leverage of firms, driven by the growth in non-equity partners described above. While the profit story for equity partners in AmLaw 100 firms is certainly rosy overall, there is an emerging segmentation of firm performance. The range from high to low in 2017 was from $5.7 million to $461,000. This dispersion is creating some instability in firms and also contributes to heightened lateral movement and competition for talent. While the growth rate of most of these metrics slowed some in the last decade compared to the previous two decades, we expect that the top firms in the legal industry will continue to add lawyers, increase revenue, and grow profits. We will continue to see the “haves” and “have less” dynamic in the industry with some firms losing market share, revenue and lawyers to other firms. Firms at all sizes and profit levels need to have a plan to respond to the changes in the industry and compete effectively over the next decade.